Yesterday’s (1/31/18) Federal Open Market Committee (F.O.M.C.) statement expressed a more confident expectation that inflation would reach its 2% target this year. Perhaps the F.O.M.C.’s more confident statement takes into account the stronger showing in the underlying inflation gauge (U.I.G.) developed by The New York Fed. 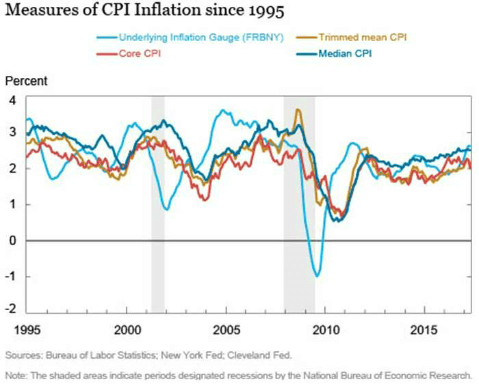 In developing this broader inflation gauge, the NY Fed assumed behavioral changes in other economic and financial series also could influence trend inflation. They define the U.I.G. as the persistent common component of monthly inflation. They created both a narrow and broad measure for this gauge. As the graph above shows, the U.I.G. tends to lead changes in the traditional measures of consumer inflation. Interestingly, the U.I.G. currently shows a sharp upward shift in the inflation trend. If this signal proves correct, it would support both yesterday’s F.O.M.C. statement and further Fed funds rate increases this year. For reasons outlined in prior commentaries, we expect four Fed fund rate increases in 2018. The broader nature of the U.I.G. provides support for slice of life indications of potential increases in price and wage inflation. We would caution that such slice of life signals are simply that and do not provide quantitative evidentiary support for increasing rates of inflation. Wages comprise the most important cost for most businesses and therefore higher prices usually follow wage increases. The recent publicity received when nearly 300 major companies either increased wages or paid bonuses could stimulate a broader level of wage inflation. Other companies will likely follow suit. We do not look on these increases as businesses suddenly becoming loose with their savings from lower corporate tax rates. Instead, it reflects one form of investment to retain and attract employees in a tight, competitive labor market. The same tight labor markets and these headlines may also enable employees to pressure their bosses for compensation increases. Overall, labor market conditions seem present to see growing wage inflation. The recent stronger economic growth produced increased trucking demand. At the same time demand increased, trucking costs escalated. Diesel fuel shows a nearly 18% increase y/o/y. Adding to the fuel cost increase, a new Federal regulation puts pressure on the availability of long-distance truck capacity. As of the middle of December, all tractors must be equipped with electronic devices that track drivers’ hours at the wheel. Combining both higher demand and costs caused spot shipping rates to shoot up to a 3 ½ year high at the end of December. Not surprisingly, higher freight costs will likely show up in increased consumer prices. Over the last year, gasoline prices increased 10% per gallon at the pump. Gasoline prices, perhaps, represent the most highly visible of all consumer prices. Most gasoline stations make those prices very visible as you drive by. In the past, we noticed major changes in pump prices would quickly be reflected in consumer attitude surveys. If oil prices continue at their recently higher levels or move up, gasoline prices should reflect these increasing costs. In our commentary (1/23/18), we outlined the reasons why restrained mining capacity and growing demand should lead to higher hard commodity prices. Specifically, the current positions of the domestic and global economies should prove a positive for hard commodity prices. Domestically, hard commodity prices normally should benefit from the maturing U.S economic cycle. At the same time, synchronous and increasing world economic growth should also prove a positive for hard commodity prices. Finally, a weaker U.S. dollar should stimulate demand for hard commodities priced in U.S. dollars. The underlying inflation gauge identifies upward risk to the trend of inflation. Our selected slice of life examples should support the gauge’s shift. Increasing interest rates on longer duration notes/bonds would be the normal response to a rising trend of inflation. With that, the slope of the yield curve would likely steepen and continue to benefit the earnings of financial companies such as banks. In addition, commodity stocks should positively reflect the higher commodity price outlook, but typically, only for some limited period.